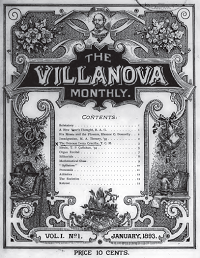 The Villanova University Digital Library will celebrate the recent digitization of The Villanovan, from its inception in 1893, and invites you to join us in Falvey Memorial Library’s Speakers’ Corner, on Thursday, Feb. 23, at 1:00 p.m.
At this event, attendees will have the opportunity to view 100 years of Villanova’s student newspaper in its new online home and share Villanovan war stories with current and past editors and student writers. The Rev. Peter Donohue, OSA, PhD, ’75 A&S, president of Villanova University, will also be in attendance. Light refreshments will be served. The event will include a welcome by Fr. Peter Donohue, a tour of the collection and overview of the digitization project by Special Collections and Digital Library Coordinator Michael Foight, a walk through the technical process of transforming the paper into a searchable online format, and will conclude with a panel discussion by Villanovan alumni Marianne Lavelle, Larry Goanos and Kate Szumanski. Previously, the Blue Electrode celebrated an issue of The Villanovan as the landmark 10,000th item to be added to the Digital Library, and explored historical advertisements from the newspaper’s pages. I am really interested in online archives of The Villanovan. So when I saw the banner announcing this, and the party Thursday, I tried to access it, but it is not working Sunday afternoon. The page linked above does not load. Yet this appears to state that it is now up and running. What gives? The Digital Library was down all weekend, kindly try again for access to this collection.